There’s something super soothing about a backyard pond or pool with a large, flowing waterfall. It’s not just beautiful—the sound is comforting, too. Top it off with a few tropical potted palm trees, and you’ll be in paradise in no time. Check out this step-by-step guide here. 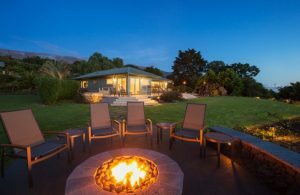 A fire pit is a great place for family and friends to gather. We love relaxing by the fire, telling ghost stories, and making s’mores any time of the year. Besides, there’s something about a campfire that just brings out the best in people. They are their purest, truest selves sitting in that circle surrounding those logs. And that means it’s the perfect way to bond with those we care about. Major plus! If you’re anything like us, you love cooking. And who can resist a perfectly grilled meal? That’s why a built-in backyard kitchen is a highly sought after upgrade. A brick patio leading to a large, built-in grill, pizza oven, and seats is a welcoming way to invite our guests to spend time outside. It’s beautiful and functional at the same time! If you’re not into cooking, why waste all that time building an outdoor kitchen? Go for a gazebo instead. Built as tiny or gigantic as you want, a gazebo is an appealing place to unwind after a long day of work — especially when the weather is great! Whether it’s tricked out in functional tech gear (like built-in speakers or an automatic misting system on the hottest days) or covered in beautiful outdoor furniture, a gazebo is one of our favorite spots to enjoy outside. Speaking of outdoor furniture, nothing beats a great hammock. It’s cozy, it’s cuddly, it’s romantic, and it’s relaxing. What more could we ask for? On top of that, they look great and they’re extra fun for kids. When buying a hammock, make sure that you purchase a quality product that is both comfortable and safe. Whether the hammock will be standalone or tied to a tree, you will want to ensure the proper set up so that everyone can safely enjoy its relaxation. The kids also deserve their own taste of a backyard paradise. And what does every kid secretly want? A designated play zone filled with the best backyard toys, like a giant outdoor trampoline! They’ll have the time of their lives. And trust us, you won’t regret it. If you’re looking into purchasing a trampoline for the yard, you’ve come to the right place! Contact us at JumpSport today and browse our many backyard trampoline options.